From time to time I post our setlist from our church's Sunday AM worship service This entry is part of the Sunday Setlists over at TheWorshipCommunity.com. There you can check out what churches are doing all over the country. Here's what we did today in our AM service at Westwood Baptist Church in the Forestdale community of Birmingham, AL (With my notes). Southern style – have fun with it. V1, C, V2, C2x, “Who was and who is” ending. Why: Favorite from years ago that people still request from time to time. Why: Yeah, this is an old Petra song from the mid 80's. As I feared, very few of us knew it. But I think some people responded well to the chorus even if the song was very different than our normal style. Fit perfectly with the message. Why: This song was requested by one of our students a few weeks ago. Been on my mind ever since. We haven't done it in years. Might be time to put it back in the rotation more often. Transitional Chorus: For All You’ve Done - Made a change from singing Indescribable again to the chorus of this spur of the moment. The chorus just seemed to fit well with what we were about to hear about being prepared for battle. Nice to know God is on our side and that "all things work together for our good." Awesome quote from the message: Spoken by Bro. Steve while holding a toy sword and talking about the sword of the spirit - "My name is Inigo Montoya. You killed my father. Prepare to die." Overall, I thought we had a good service. Attendance was way down. I blame the rain. I saw this recently on my way to work. I couldn't help but wonder about the thought process that led to the decision to communicate with the city using this method. I imagine the concerned citizens (I'm assuming that it took two inspired neighborhood watchmen to create this message) had a discussion that went something like this…. Concerned Citizen #1: Man, I sure am tired of that crackhouse being in our neighborhood. I wonder if there's a good way I can let the city know how I feel. Maybe I should write them a letter? Concerned Citizen #2: Nah, that'd take too long. And besides, who wants to have to go to the trouble of finding paper and pen then spending almost .50 on a stamp. No way. CC#1: Maybe I should call them? CC#2: Nope. That would require looking up a phone number and pressing at least 7 buttons on your phone. CC#1: I know, how about a twitter or facebook message? CC#1: I got it! You see that can of spray paint over there? Are you thinking what I'm thinking? Maybe it didn't go like that. We'll never know. That will be left up to our imagination. Much like the answer to these questions. 1.) Did they not have enough spraypaint for punctuation? 2.) 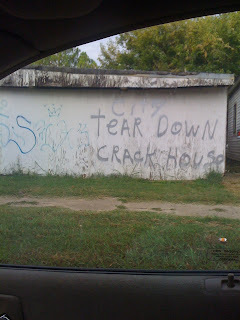 Are they saying, "Hello City, This is a crackhouse. Please tear it down."? Or are they requesting for the city to tear down all crackhouses? 3.) Why silver paint? Was it all they had? Is there another color that could have communicated their thought more clearly? Like Magenta? 4.) Is the owner of that house upset by the commentary on his wall? 5.) Is this the beginning of a new way to communicate with city leadership? Will we see more messages to the city in the coming weeks? If you had a can of spray paint, what would you tell the city today? like this somehow says enough.